The Compact Rehabilitation Robot (CR2) is a series of robotic system that are developed for effective rehabilitation training. 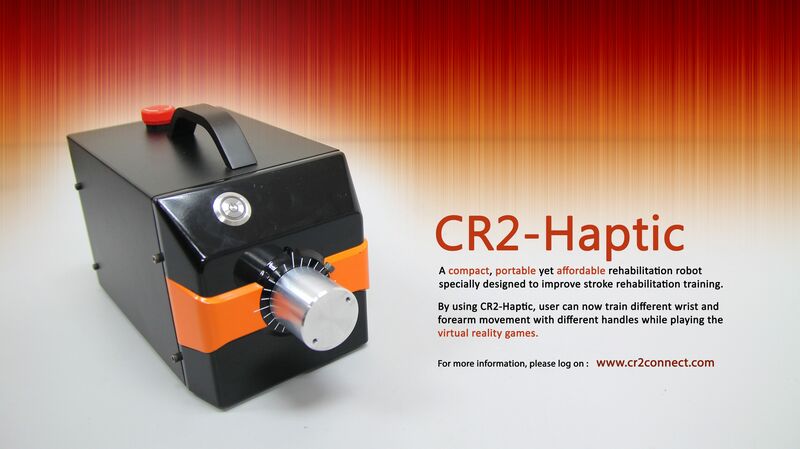 CR2-Haptic is one of the CR2 robots, and it is designed to train forearm, wrist and basic activity of daily living (ADL) movement. It can be used for individuals who have suffered strokes, traumatic brain injuries or other neurological disorders resulting in hand and arm impairment. It is an affordable, portable and compact rehabilitation robot which can be used to train for their muscle function while playing the engaging and motivating virtual reality games. Besides, CR2-Haptic enables patients to train at home by integrating tele-monitoring technology that enables therapists to monitor patients' progress through internet. With this feature, therapists and family members can easily analyse and review the progress of the patients through Internet. One in six people in the world have a chance of getting stroke in their lifetime. 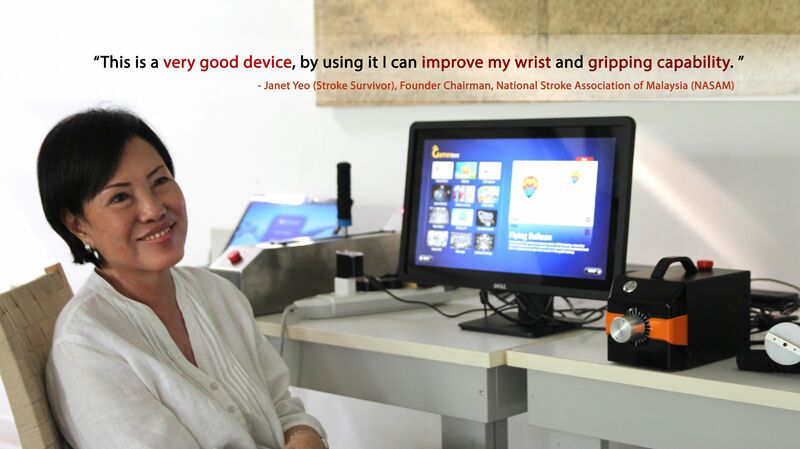 In Malaysia, there are 52,000 people suffering stroke every year. We have visited many rehabilitation centres and hospitals around UK and Malaysia including NHNN London, NASAM PJ, NASAM Penang, NASAM Melaka, and general hospitals. We observed a common problem: There are too many patients but not enough physiotherapists. This affects the rehabilitation activities among the stroke patients. Some of the patients lost their confidence due to the long rehabilitation period and even gave up due to many difficulties. Besides, conventional rehabilitation methods with physiotherapists are also labor intensive, subjective, costly and inconsistent. Robotic technology is a new frontier to assist in stroke rehabilitation. Clinical studies also proved that rehabilitation robot can help to speed up the recovery process of the patient. There are several commercially available rehabilitation robots in the market such as In-Motion Arm and Reo-Go therapy. However, these robots are too costly and not suitable for home use. Thus, our mission is to develop a set of Compact Rehabilitation Robot which is affordable, portable and yet effective. 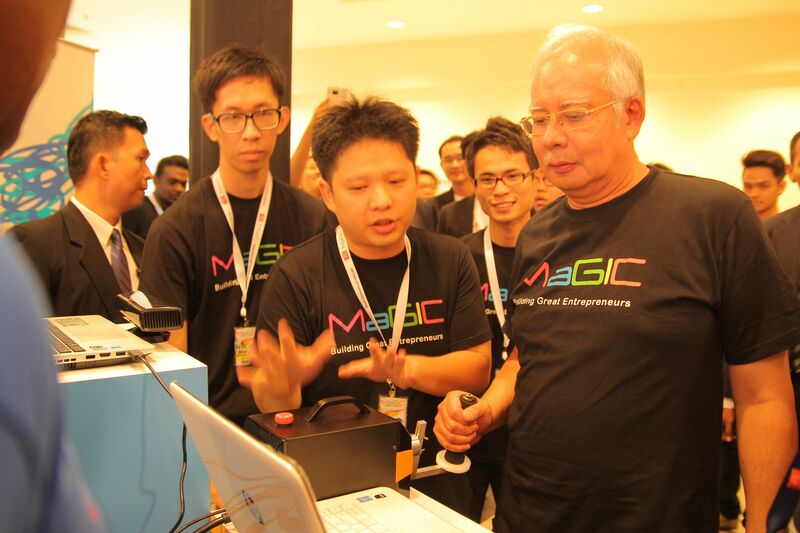 Our funding goal is RM5000. 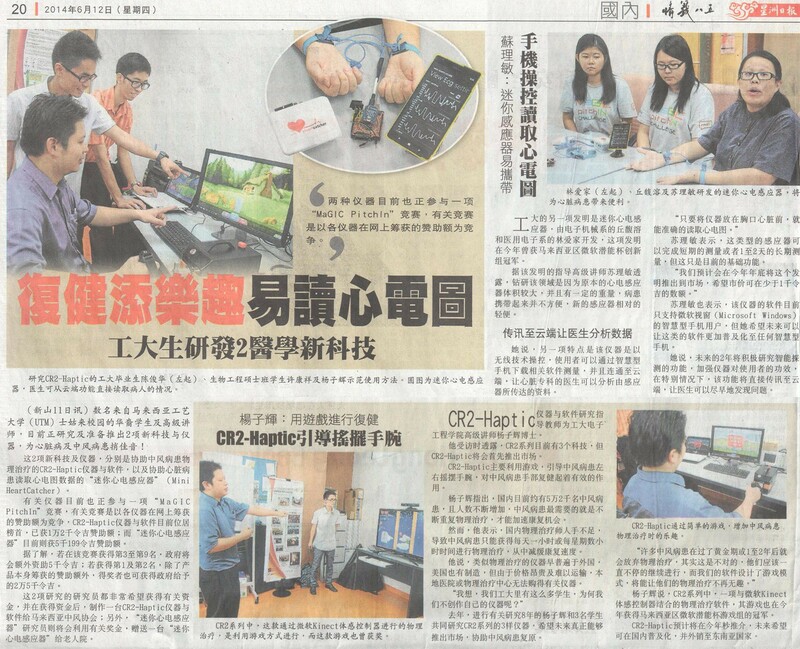 With this, we can provide 1 unit of the award-winning, custom-made VR Game using Kinect for stroke rehabilitation (1st Microsoft Imagine Cup 2014) to National Stroke Association of Malaysia (NASAM). Our ultimate goal is to raise a fund of RM35000. 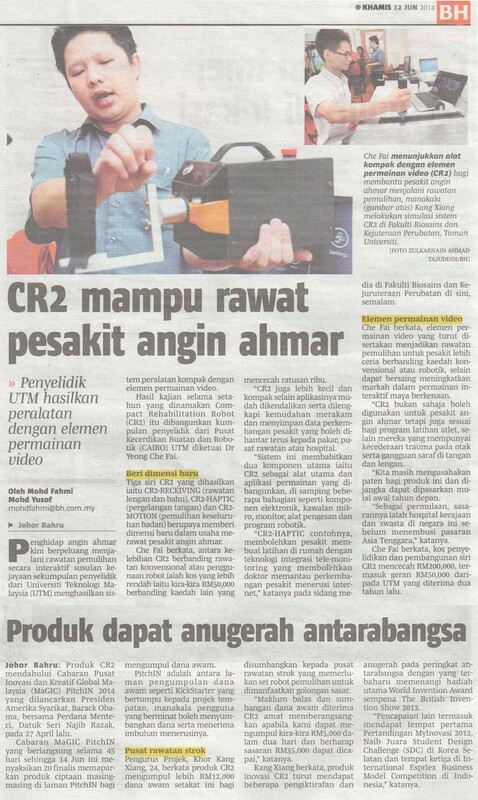 With this fund, we will develop a new robot set, CR2-Haptic and give it to NASAM. By supporting them a full set of robotic rehabilitation system, we hope we can help to improve their current rehabilitation training and provide the patients a faster track towards recovery. However, the person must send pitchIN the proof of transfer by attaching the receipt to the email address: [email protected] with the Subject Heading: CR2. Upon receiving that, the folks at pitchIN can then quickly update the project page. We understand you want to contribute but your preferred amount that is not listed here. We welcome any type of contribution. This will contribute for us to buy the screws and nuts for the robot. Ever little piece count! We want the world to know how much you have help us. We will send you a personal email to show our greatest appreciation on your contribution. With this contribution, you help us to buy electronic components for this robot. To thank you for your generous support, we will mail our greatest appreciation card to you. You help us to develop the embedded system of the robot. For your help, we will proudly list your name on our website under our special "thank you" in our official website. You will also own a CR2 special edition T-shirt. With this, you fund us for coding the software of the robot. To thank you for your great contribution, we will proudly list your name on our website under our special "thank you" in our official website. You will also own a CR2 special edition key ring, cap and T-shirt. Thanks for your wonderful generous contribution. In return, your name will be mentioned in our website under bronze sponsor. 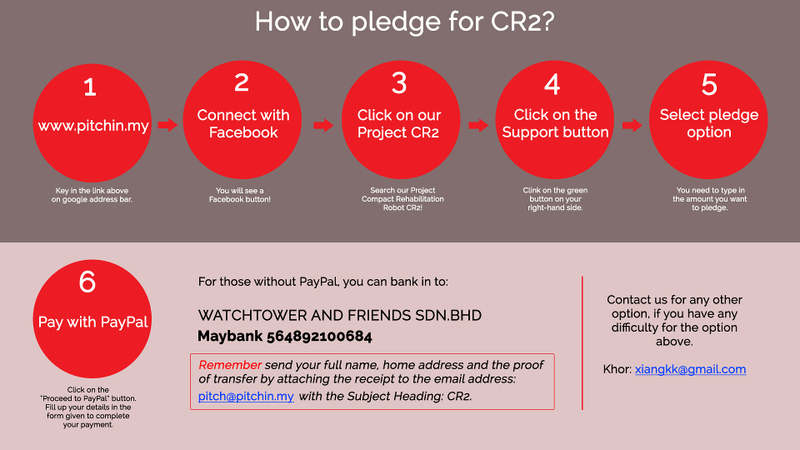 You will also own two sets of CR2 special edition key ring, cap and T-shirt. Your love keeps us warm. In return, your name will be mentioned in our website under silver sponsor and also will be put on the product. This will also come together with five sets of CR2 special edition key ring, cap and T-shirt. At this level, you have our sincere and humble thanks. 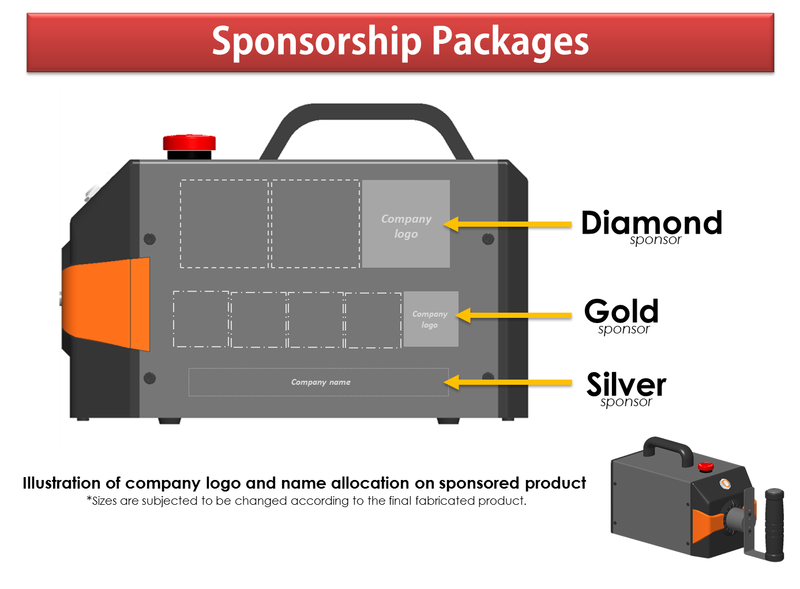 Your company logo will be on the sponsored product and mentioned in our website under Gold sponsor. This will also come together with five sets of CR2 special edition key ring, cap and T-shirt. You are everyone's angel. We will always be grateful for all that you have done to help our stroke community. With this contribution, your company logo will be on the sponsored product and mentioned in our website under Diamond sponsor. This will also come together with ten sets of CR2 special edition key ring, cap and T-shirt. If our passion has touched your heart and you have the means and the compassion to assist at this level, we are making this option available along with our love and gratitude. With this contribution, you can decide to put another full working CR2 to any of your chosen rehabilitation centre. And, of course with all the perks above.